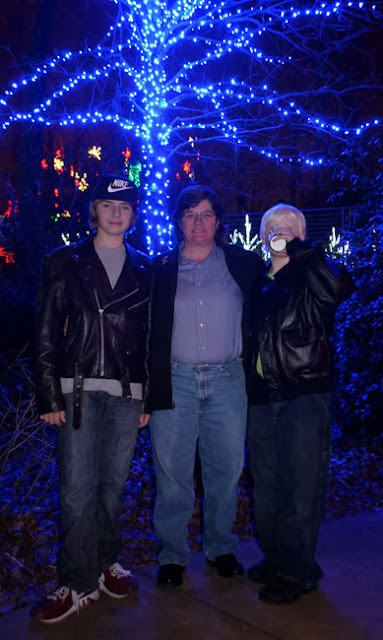 I recently went to Garden Lights, Holiday Nights at the Atlanta Botanical Garden with MaryJo and the boys and a coworker of MJ's. We had a magical time. We lucked out. There was zero rain and it was a relatively balmy night. You may recall that MJ and I took the boys to the Garden this past summer to see Imaginary Worlds. We had then talked about visiting Garden Lights. I'm so glad we did...it was great to see the guys enjoy this new, awe-inspiring Atlanta tradition. Let me start with a tip: To help ensure you have lasting memories of your visit, perhaps visit a photography site or two that offers nighttime photography tips. Just be sure that the tips they're talking about are relative to your particular camera. This year's show has some new features! 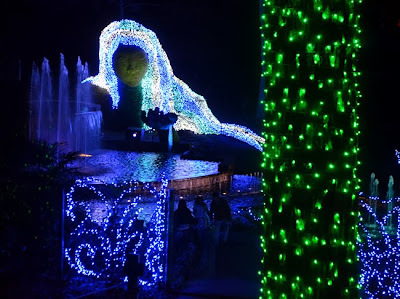 Perhaps you saw in the news the announcement that the Garden got to keep Earth Goddess for Garden Lights, who has been transformed into Ice Goddess. 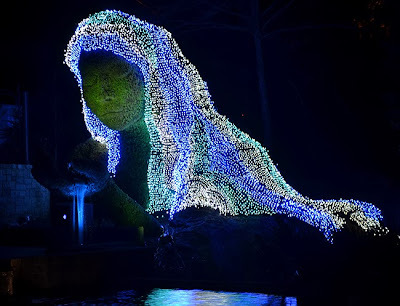 Her hair twinkles brightly with 16,000 blue, white, and teal lights. 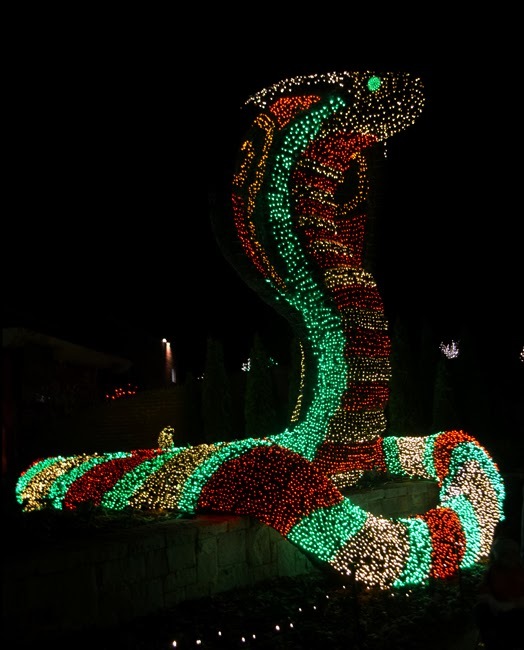 And the majestic cobras are now Candy Cane Cobras! You'll notice that Ice Goddess' face and hands are still living plants and before this photo was made we'd already had several back-to-back below freezing nights. The brilliant folks at the Garden installed heaters "inside" Ice Goddess' head and hand—to keep the plants' roots warm and to prevent freezing. It looks like it's working quite well! The Orchestral Orbs on the Great Lawn in front of the Fuqua Conservatory are singing some new songs this year! 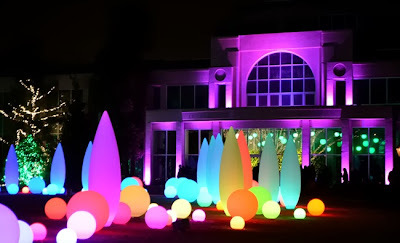 Did you know that the Orbs can produce up to 16,000,000 different colors? Fascinating! The guys (that's them with MaryJo) had a great time. In addition to the 11,000 strands of lights, we enjoyed the model trains, 70-plus stars in the Glittering Galaxy, 150 trees, shrubs, and tree-wraps throughout the Garden, as wells as the deliciousness of s'mores—that we made ourselves in fire pits near the Cafe! There's LOTS more to see and experience...I've only covered a few things here. There were thousands of people there that night, this past Thursday! And I'm sure the nights leading up to Christmas and New Year's will be equally as well attended—as long as the weather cooperates. Remember that Garden Lights is open EVERY NIGHT through January 4. There are two items that I'd like to point out to help you ensure that you have a pleasant experience. Buy your tickets online. Certain days are selling out (like Monday, December 23) and you don't want to fight holiday traffic and wait in line only to discover that there are no more tickets for the evening you're there. The other point is to ARRIVE EARLY! The parking deck has a finite number of spaces and it could easily fill up. As many spaces as the lot has, it's frustrating to have to go find parking somewhere else (even though some of us remember that not too long ago there were only a few dozen spaces—the new parking lot has made things so much better for the visitor experience!). The good news about parking is that it's only a $5 flat fee. 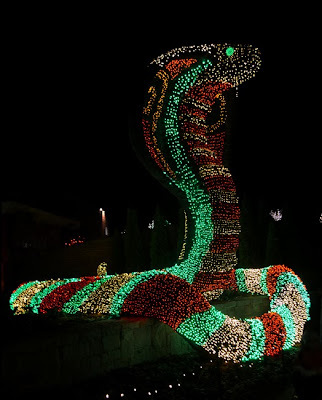 The cobras are just as fascinating now as they were this past summer. 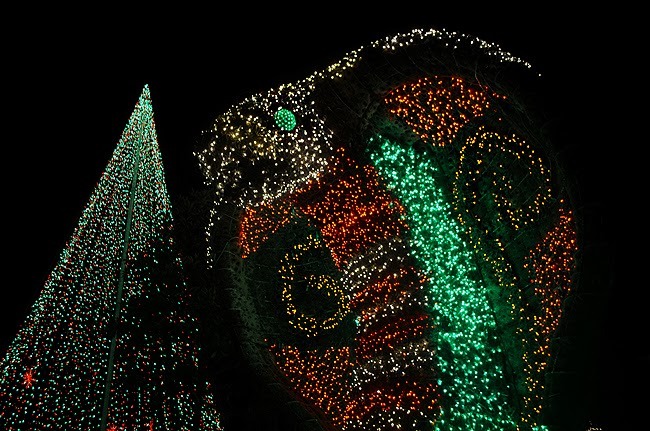 With 62,000 lights, it'd be a challenge to not be fascinating! 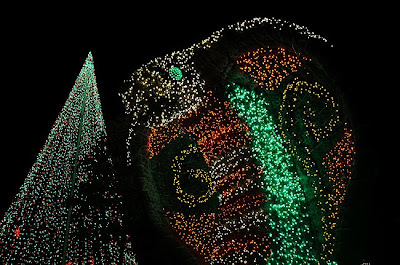 The smaller cobra has 22,000 lights and the larger cobra has 40,000 tightly packed lights. 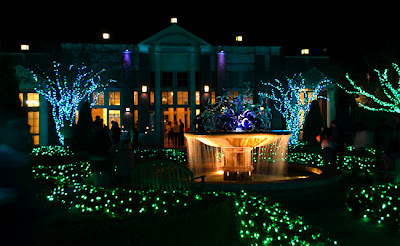 The Garden Lights team and Garden volunteers put in a LOT of hours to bring us such a wonderful show! Whether you've never been to the Atlanta Botanical Garden or saw Imaginary Worlds a dozen times, I highly recommend seeing Garden Lights, Holiday Nights—there's nothing else quite like it in Atlanta!